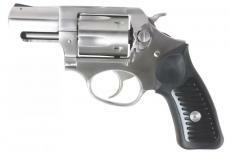 The Ruger SP101 revolvers are smaller framed guns which still can handle powerful .357 Magnum cartridges. They also feature a smaller Ruger cushioned grip system with no exposed metal at the back strap for shooter comfort, the patented triple locking cylinder mechanism that securely locks the cylinder into the frame at the front, rear, and bottom, and a stainless steel frame that has no weakening side plates. Built as some of the smallest, most powerful, smaller frame revolvers on the market, they feature Ruger's rugged durability and are engineered for solid performance.